Toulmin served as a member of the New Zealand Air Force (Territorial) from 19 Nov 23 until placed on the Retired List on 6 Jun 30. His appointment was in the rank of Lieutenant, the rank being re-designated as Flying Officer in December 1929. I am presently in the process of compiling some 800 or so biographies for my next work Ack Emmas to Zeppelin Hunters – New Zealand airmen and airwomen in the Great War and Russia, 1914-1919 and would therefore be most interested in seeing a copy of the documents that you mention. I presume you have already obtained copies of his AIR79, AIR76 and WO339 records? If not I can assist with the first two now and the latter in due course. Fascinating, and also an example of the complexities of finding and classifying 'New Zealanders'. Yes, very interesting indeed, thanks for posting Blackferris. Aviator notched up almost 1200 hours, 11 victories and military honours over France. Blenheim-born Captain Clive Franklyn Collett MC and Bar, became New Zealand's first fighter ace with 11 victories. Lady luck ran out for skilful pilot Clive Collett two days before Christmas in 1917. Collett, one of New Zealand's most accomplished World War I aviators, had flown nearly 1200 hours in dozens of different aircraft when he took to the air in a captured German plane over the Firth of Forth. The 31-year-old was comfortable with the single-seat Albatros DV, which had been forced down intact behind Allied lines in July 1917 and flown back to Britain for tests. A skilled Royal Flying Corps demonstration and experimental pilot, Collett had been flying the Albatros since October, taking the Mercedes-powered aircraft around Britain to show training and reserve squadrons. On the day of his last flight the Tauranga-trained engineer took off west of Edinburgh and headed over the Forth estuary. On his final manoeuvre, a Court of Inquiry later found, Collett misjudged his height above the sea and crashed. He was buried on December 28 in the Scottish city. Marlborough-born Collett spent two years in the Territorials in the Bay of Plenty and went to England soon after war broke out, arriving on December 23, 1914. 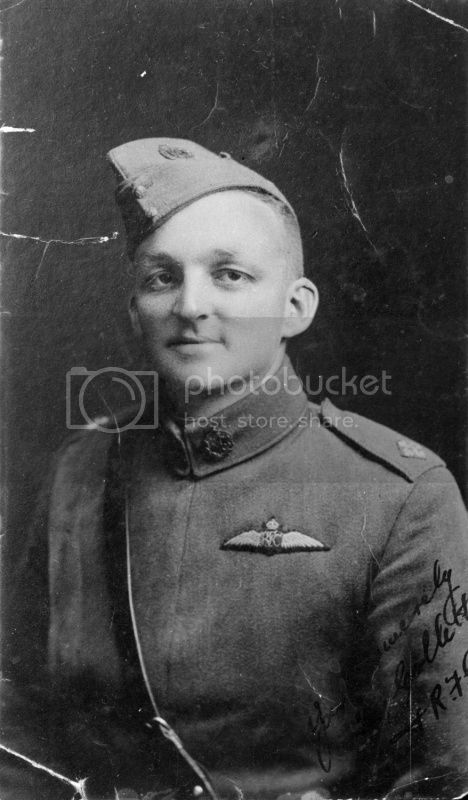 By the end of January 1915 he had his Royal Aero Club Aviator's certificate from a north London flying school and six weeks later joined the Royal Flying Corps. Posted to active duty in France in March 1916 with 18 Squadron, Collett wrote to his older brother Horace disappointed that his Vickers FB5 biplane was "too slow to catch the majority of the Hun machines". He would take his machine up to 10,000ft while an observer took photographs of enemy positions. Anti-aircraft shelling made for close shaves, he wrote: "We nearly always find some holes through the wings." On April 18 Collett crashed a plane and was sent back across the channel for treatment. In June, Collett, now recovered, was transferred to the Experimental Armaments Squadron in Suffolk as a test pilot. On January 13, 1917, the flight commander created British military history with the first parachute jump from an RFC plane. One account reported he dived head-first from the lower wing of a BE 2C aircraft from 600ft (180m). 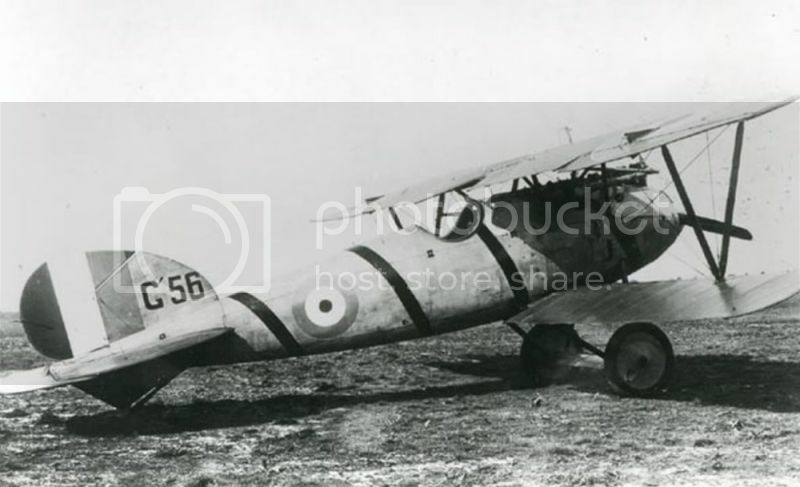 By the middle of the year Collett was posted to 70 Squadron in northwestern France, arriving as the unit acquired new fighters -- Sopwith Camels. Out of an evening practice flight near Ypres on July 27, Collett described how he was chased by five German aircraft. After clearing a jammed gun, Collett fired a burst into the fuselage of one fighter. "He hovered for a moment, fell over on one side and then dived over the vertical," the airman's combat report noted. For his skill and bravery, Collett was awarded a Military Cross. The citation noted that he had attacked and destroyed enemy aircraft and driven others down out of control. A Bar awarded soon after said Collett had nailed three enemy planes in a single day, attacking from low altitudes "the greatest dash and determination". British pilot and Victoria Cross winner James McCudden recalled that the eager Kiwi "used to come back shot to ribbons nearly every time he went out". On his last mission in France, Collett came under fire from three German fighters and, in pain from a hand shattered by an enemy round, skipped home above the trenches at just 12m. 100 Kiwi Stories runs every Monday and Thursday. Shorty Fowler flew for both CAC and NZAT post-war. No doubt Errol can add more detail. Blenheim-born Captain Clive Franklyn Collett MC and Bar, became New Zealand's first fighter ace with 11 victories. 46 Clive Collett. Lady luck ran out for skilful pilot Clive Collett two days before Christmas in 1917. One of my favourites. He was from Spring Creek, not Blenheim itself. Collett's Casualty Card states that the accident was "...not due to any structural breakage or jamming of the controls." It has since been diagnosed that this assessment of the accident has been overruled, based on two factors: that the Albatros was prone to bits breaking off in flight and Collett’s excellent flying record. After all, he had spent many hours carrying out similar manoeuvres in that particular machine. A common fault of the Mercedes D IIIa six cylinder in-line engine fitted to the Albatros was that it had a nasty habit of shedding its exhaust manifold in flight. It is now generally accepted that Collett was struck in the head by the machine’s exhaust pipe as it detached from the engine. It is probable that he was knocked unconscious by the offending piece of metal. Whether Collett died on impact with the water or whether he drowned as the aircraft sank is not known. Coincidentally, he had lost his life three years to the day on which he had arrived in England after leaving New Zealand aboard the steamship Limeric. Courtesy of the Air Force Museum of New Zealand. 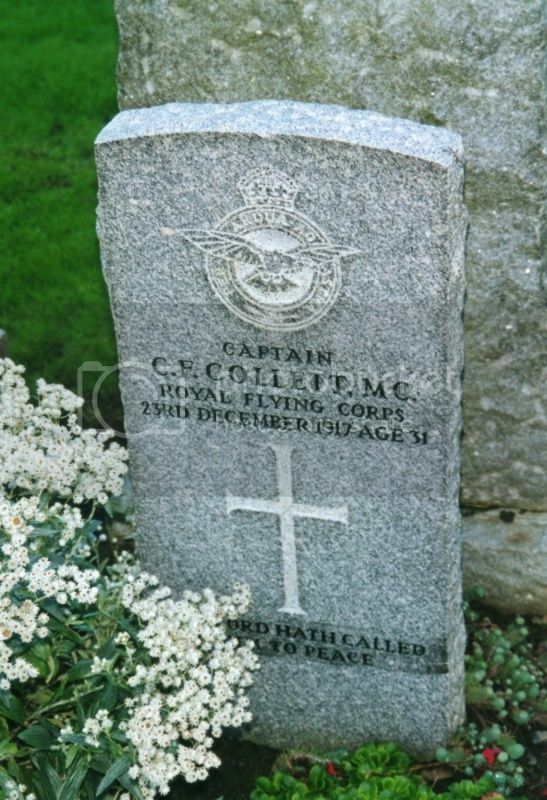 Collett is buried in Comely Bank Cemetery in Edinburgh. This is Albatros D V 1162/17 as G'56 as Collett flew it. Piloted by VizeFlugzeugmeister Ernst Clausnitzer, Albatros D V 1162/17 was forced down intact at Poperinghe, Belgium by 2nd Lt. Langsland flying a SPAD VII of 23 Sqn on 16 July 1917. Another name to add to the list is Lieutenant Michael Scott Campbell Gordon, a pilot from Hawkes Bay who served with 70 Sqadron Royal Flying Corps. His son, also Michael, lives in Napier and has an interesting collection of his father's photos and other artefacts. As well as photos taken on aerodromes there are a lot of aerial photos of the France/Belgium battlefields. There is a particularly interesting oblique of Ypres showing the town as a pile of rubble. (by the 1960's buildings in Ypres were rebuilt, stone by stone from the rubble,to be virtually identically the same as they were before the war started). There is also a windscreen off Gordon's aircraft with a bullet hole through the glass - said to have been fired by the Red Baron, so the story goes! I'm a bit confused. The post about Clive Collett says he was NZ's first ace, but all the info I have about Thomas Culling says that he was NZ's first ace. Or are we differentiating between first kiwi ace in RFC and RNAS as Collett was one and Culling was the other. I think the NZ Herald got it wrong with Collett. Yes, you're right Nooby, Culling was the first New Zealand ace; Collett was the first New Zealand RFC ace. I made a similar mistake when I published an article in NZ Memories magazine awhile back, I didn't include the RFC bit by mistake and so it read that Collett was NZ's first ace. My friend Eris Parker, who is the ex-curator of the Cambridge Museum, now retired, has taken a research project on for herself, looking into and compiling a database on New Zealanders who became Prisoners of War in World War One. She's interested in anyone, whether NZ Army, Air Force, Navy, kiwis serving with the British, Aussies or Indians or whoever, even civilians interned, etc, who became prisoners of the enemy in the Great War. I asked her which kiwi airmen she'd found so far and she gave me quite an impressive list, which includes a lot of names not yet on this thread. She has given me permission to post the list here,and if anyone can add more to it, or help with full names and details of those on the list, or details of any other kiwi POW's in WWI, she'd be keen to hear. I can pass any info on to her. Thanks Errol. Whoops, that spelling of Gray was my typo. I thought I'd corrected it before I posted. And my spelling of Hamilton was down to not being able to read my own handwriting, haha. Corrected now. Your Randall Henry Topliss has no service record online. Eris rechecked and she says Mack was an error, so not to be included on the list. He was probably Royal Field Artillery - RFA - she says. They are one and the same, Dave. Randall Topliss had a peculiar way of writing his Ls (they can easily be misread as Fs). You can see a good example of this in his writing of Westland on one of the documents in Archway. Ah yes, I see what you mean in his service record. Harkness was the fellow who was killed in the Dornier Libelle when it crashed off Milford beach in Auckland 1929. He was at that time a lecturer at Auckland University. Yerex founded an airline in South America after spending some time as a stunt pilot in the USA.